Zipporah, 23, who goes by “Zippy,” didn’t believe she had much of a future in Kenya. 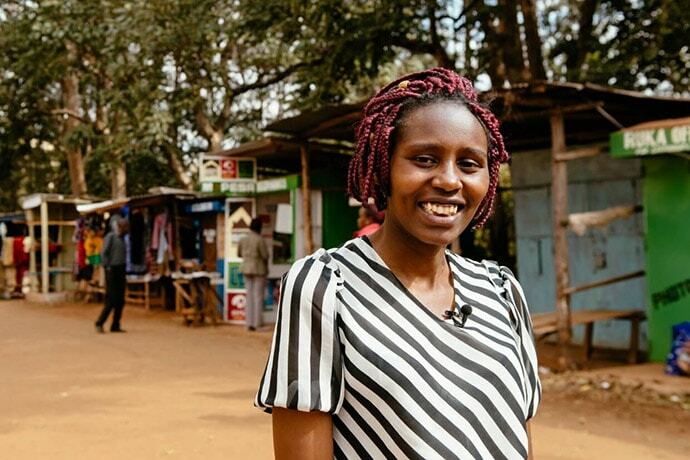 After receiving financial training and being connected to a business mentor, Zippy has become a leader in her youth group, as well as a savvy entrepreneur with two clothing shops and a cybercafe. She now sees herself as someone who can effect change in her community, and she says she intends to run for local office in the next election. Photo: Corinna Robbins / Mercy Corps. Last November, American women made history when a record number of women won seats in the U.S. House of Representatives. This was not just a win for women. Research shows that when women have decision-making power, communities as a whole benefit. Yet in many developing countries around the world, women struggle to even have a voice in their own homes. However, global development practitioners are finding that when women have more economic freedom, they often also gain voice and agency at the household level, community level and even beyond. Women and girls are disproportionately affected by poverty, discrimination and exploitation. Globally, they bear the lion’s share of unpaid household work, which according to a recent Oxfam report would be equal to about $10 trillion in annual sales at a single company – or about 43 times that of Apple. If they do have access to employment opportunities, they’re often insecure, low-wage jobs, according to UN Women. Gender discrimination also hampers their access to assets – like land and loans – and their ability to make economic and social decisions. All in all, poverty cannot be eradicated without gender equality. That’s why development organizations and agencies have been focused on reaching women with economic empowerment programs. These include savings, cash transfers, microcredit, financial literacy training, skills training, cooperatives, market access, and other initiatives to help them gain access to economic resources. The UN identifies three economic interventions that have proven to work for all women: savings, child-care provision and land rights. Other interventions are rated as proven or promising for poor, very poor, young and/or all women. For example, networks and mentors are promising for all women, while conditional cash transfers and demand-driven job services are proven to work for young women. “Women know what their children and their communities need and they make those investments when they have the means to do so,” she says. At the household level, the extra income allows women to have more say in economic decision-making, often for the benefit of the whole family. Studies have found that women spend about 90 percent of their earned income on their families – for better food, school fees, health care – compared to men, who spend 30 to 40 percent on their families. For some, the extra savings, loans or income means they can start a business that serves their communities, as well. But perhaps the most transformational impact is the empowerment. CARE actually defines women’s economic empowerment as the process by which women increase not only their right to economic resources, but also their power to make decisions that benefit themselves, their families and their communities. Oxfam’s Saving for Change program is a village savings and loans program that teaches women how to save money regularly, borrow from the groups’ pooled funds and repay loans with interest. Gathering regularly for savings groups, cooperatives or other economic activities has been shown to increase women’s confidence, facilitate collective action and improve their ability to negotiate with men. According to Oxfam, “empowered women members” of their Saving for Change program have since asked for a suite of training modules to further increase their economic and political participation. For example, the “SfC + Citizenship” module teaches members about ID cards, paying taxes, having birth certificates for their children, voting, running for office and holding local leaders accountable for public services. “Saving for Change is as much about strengthening member’s voices as it is about increasing their financial inclusion,” the organization’s website says. According to Oxfam, participation in the savings groups are empowering women to get involved with – and even elected to – local decision-making bodies like village and municipal councils and water boards. Women’s economic empowerment is an end goal in itself even as it serves as a means to women’s political participation. In the same way, women’s political participation is an end, but it can also be a great means of accelerating sustainable development, economically and otherwise. Some suggest that gender equality in politics promotes gender equality in the workforce, which, according to a 2015 study, could double women’s contributions to global GDP growth. Women who have been empowered by financial inclusion programs are also influencing public policy from local to national levels for better labor laws, better representation in government, and greater investments in education and health for women and girls. The following Global Washington members are supporting women’s economic empowerment and increased political agency.